Inkjet printers spray liquid ink through extremely small holes in a print-head, to create an image. The primary reason to choose an inkjet printer is for invitations, flyers and brochures. Another reason to choose an inkjet is because it can print on a wide variety of paper and other materials. 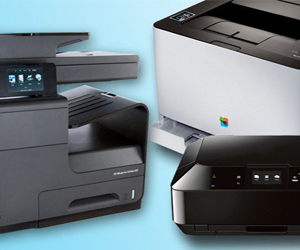 Inkjet printers are generally less expensive than their laser printer counterparts. Most inkjet printers have slow to average output speeds. Inkjets have improved a great deal over the years and the results are acceptable for reports or flyers. However, inkjet printers are not generally used for business purposes and are most frequently seen in home use. A light source beams an image onto a rotating drum. The image attracts toner from a toner cartridge and the toner then transfers from the drum onto paper through a quick baking process. Some laser printers have built-in drum units and others require drum and toner combinations. These external drum units need to be replaced periodically. Laser printers are the standard office workhorse, and are usually faster than inkjets and produce precise text as well as acceptable graphics. They are, however, more expensive to purchase and rise in cost depending on the features and output. A monochrome laser printer can be used for basic printing needs, and are reliable and simple to use. Colour printers are somewhat more complicated to manage. They have four toner colours and four drums, (one for each colour) to replace, rather than a monochrome laser's single drum. Managing the use of colours within an office can be a concern.